The medals of a soldier who fought with the SAS behind enemy lines in Italy have been sold. Lt James Riccomini escaped German captivity in Italy and joined partisan fighters. The former Nottingham schoolboy was made an MBE and awarded the Military Cross for action with the SAS before being killed in a raid in 1945. 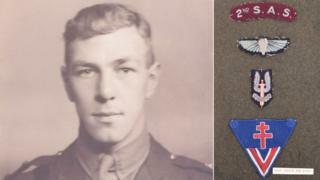 His awards, along with items including his insignia and fake Italian identity pass, have fetched £9,800 at auction. Rob Hann, whose father fought alongside the war hero, has written a book called SAS Operation Galia. He said: "Even before Galia he was a war hero because he had escaped from captivity. "He was in a notorious prison camp in Italy - alongside the man who founded the SAS Colonel Stirling - and was being moved by train to Austria. "The story goes that he and some comrades sawed a hole in the bottom a cattle truck and jumped for it." After fighting with partisans for several months he made it back to Britain via Switzerland and joined the SAS. Because he could speak fluent Italian, he was parachuted back into the area near Genoa in December 1944. Operation Galia saw a column of German vehicles successfully ambushed but Operation Tombola saw tragedy strike on 27 March 1945. Mr Hann said: "Typical Riccomini, he was leading from the front in an attack on an enemy HQ where they were heavily outnumbered. "He tried to get up the stairs of the HQ, along with two other SAS men, and sadly died in a hail of machine gun bullets." The solider's MBE, Military Cross and other medals, along with letters he wrote to his wife, documents and photos were sold by C&T Auctioneers in Ashford, Kent.